How about telling your android device to call your niece or grandmom? Google would do that for you! Your relationship status is not just restricted to social media or your personal life,now you can save it on your mobile too.You can train your Android device to call your wife or your daughter.You can just say “Hey Google,text my mom” or may be.. “Hey Google email my boss” . Sounds pretty interesting and useful right? So make sure you know how to utilise this feature on your android device. Launch the Google app on your device. Touch the microphone option or say “Ok Google” .Now tell the nickname you want to set for your contact. 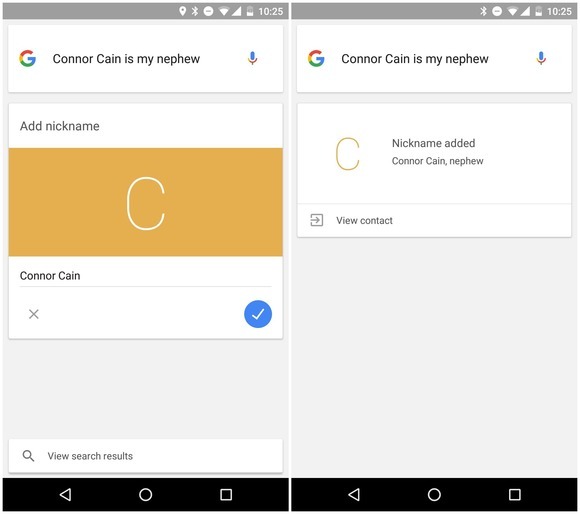 For example-“Amelia is my mum “.It will display a list of contacts with the first name .If Google doesn’t find the right contact,spell out the name correctly. If you have a lot of contacts with the name “Amelia”,choose the right one . Now just select “Add nickname”. How about sending Hangout messages,calls and texts in this way ?It would save a lot of time and it is very easy to use . This feature is available only on Android devices in which the Usage language is set to “English”. Google is very smart .It can help you erase the nickname too . Just open the app and tap the microphone or say “Ok google “. Now just say “Amelia is not my mom “. The nickname is erased once you tap on the “Erase nickname ” button . This feature doesn’t work with all third party apps. There is no need to get disappointed though .Keep trying or just keep waiting while Google improves this feature for you .There are many developers trying to enable some more features .